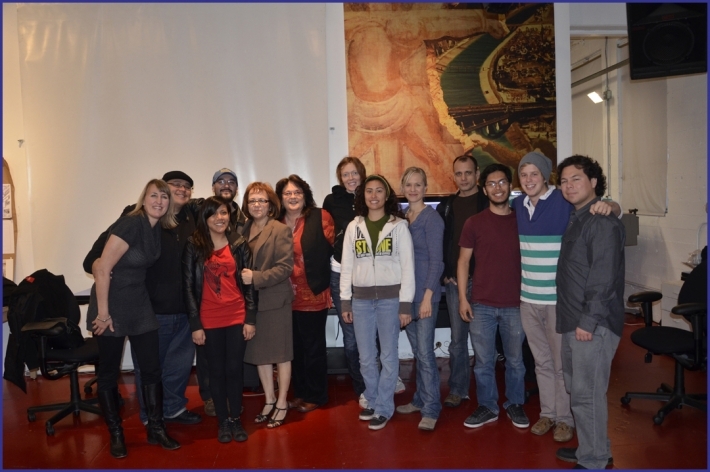 Last year, Distinguished UCLA Professor Judy Baca’s UCLA students of the UCLA@SPARC Digital/Mural Lab “Beyond the Mexican Mural”courses (at the request of Maria Elena Durazo, of the American Federation of Labor and Congress of Industrial Organizations–AFL-CIO) collaborated with the UCLA Labor Center, Professors Kent Wong, Janna Shaddock Hernandez, the Miguel Contreras Learning Complex (MCLC) High School Students, and SPARC to produce a new 18ft by 33ft Digital Mural for permanent placement in Downtown Los Angles. 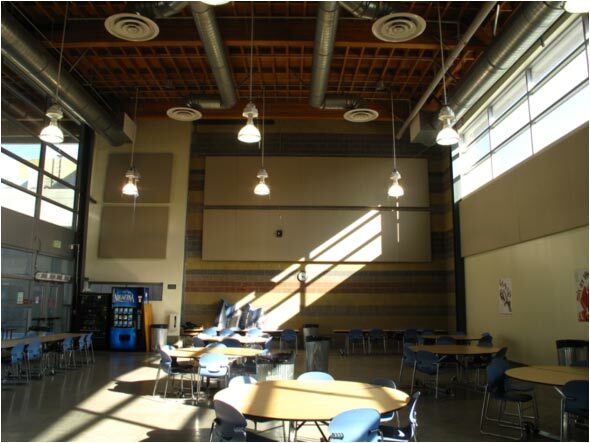 The work, sponsored by the Miguel Contreras Foundation, is installed in the Miguel Contreras Learning Complex Cafeteria. 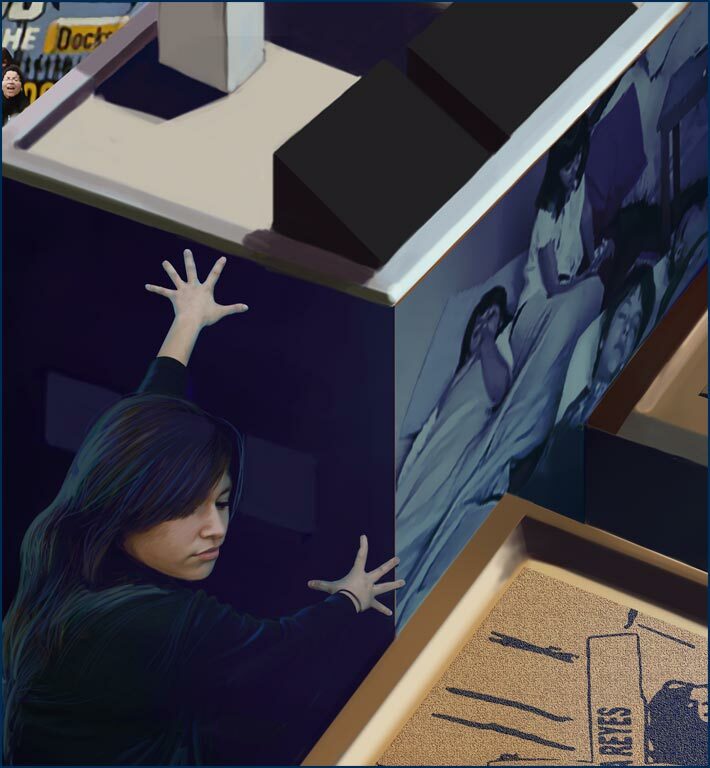 The UCLA students took on the task of developing a mural (Within a 20 week period) that would not only commemorate the legacy of labor leader Miguel Contreras, but also illuminate stories of labor, struggle, social justice, determination, and triumph of the Miguel Contreras Learning Complex community. 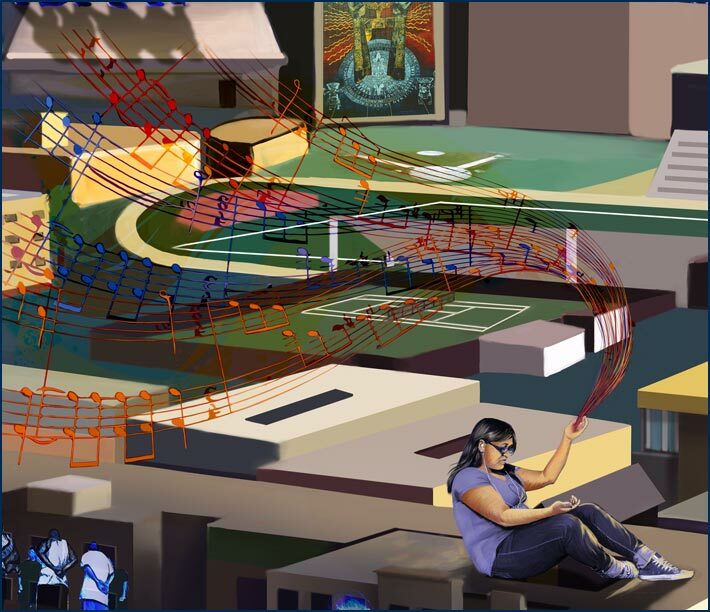 The quest for the development of “Gente Del Maiz” began with a collaboration between the UCLA students and the Miguel Contreras students in which a series of workshops on the high school campus as well as the UCLA@SPARC Digital/Mural Lab took place. 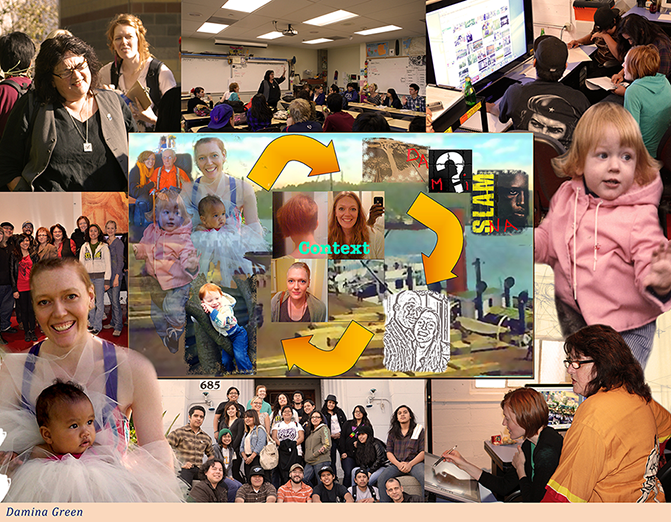 In conjunction the group of students mutually exchanged their stories and knowledge. The UCLA students captured a glimpse at the unique and rich experiences of the Miguel Contreras students and their community. These experiences include but are not limited to the constant struggle of achieving dreams of success while facing numerous obstacles. Such struggles enclose insufficient academic resources, gang violence, police brutality, financial hardship, and facing the pressure of prioritizing their families’ well being as opposed to personal pursuit of graduation and higher education. In addition to the students’ perspectives, the UCLA students had the privilege of speaking to parents who shared their struggles and hopes for their children. 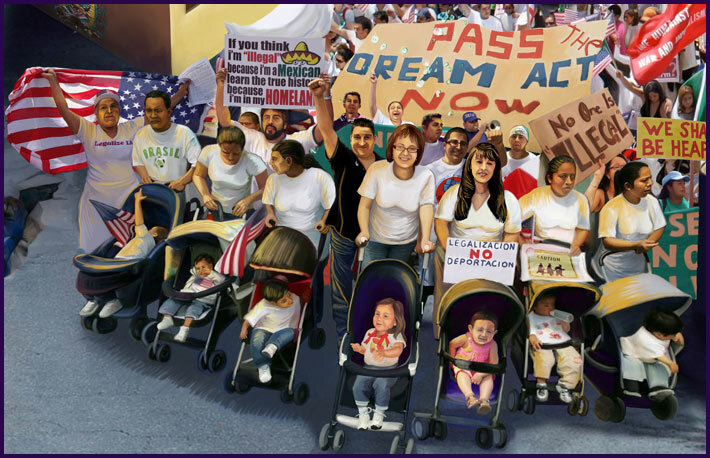 They also expressed their struggles and victories as undocumented and documented immigrants in the United States. The parents explain that among their greatest concerns lies the limited resources they could offer their children due to monetary scarcity and lack of information. The parents of the Miguel Contreras community persistently encourage their children to do well in school and pursue a higher level of education that could finally provide the “American Dream” for which they migrateed. UCLA students highlighted reoccurring themes in the community’s experience through the testimonies provided by the parents and students of the community. The Miguel Contreras Learning Complex students were then invited to the Digital Mural Lab to materialize these themes into visual stories. Utilizing state-of-the-art computer technology at SPARC, students were able to produce important imagery representing the reality and unique beauty of their community. These elements were then woven into an image that intertwined the community’s experience with the history of Miguel Contreras, labor leaders, social justice struggles, and aspirations for the future. 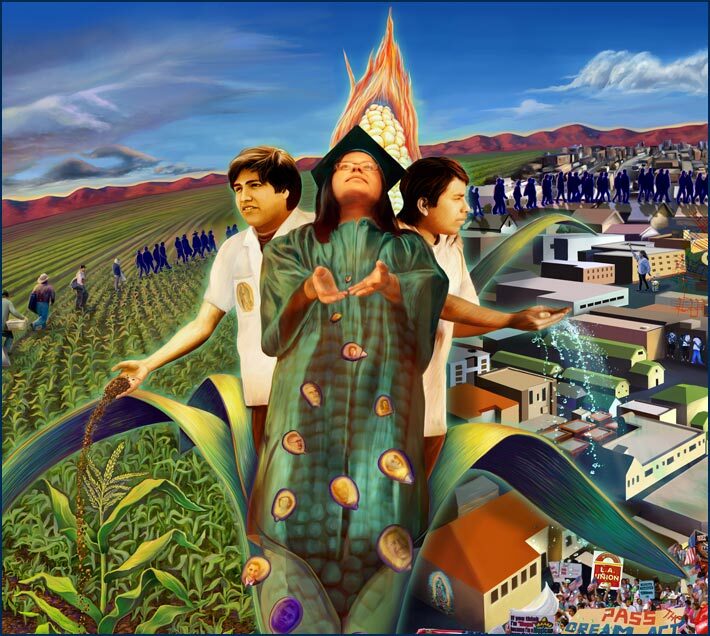 The extensive development of “Gente del Maiz” resulted in a piece that commemorates the legacy and work of Miguel Contreras and promotes community ownership, elevation of women, honor of past struggles, and empowers youth to be the planters of seeds of future dreams into the local soil. 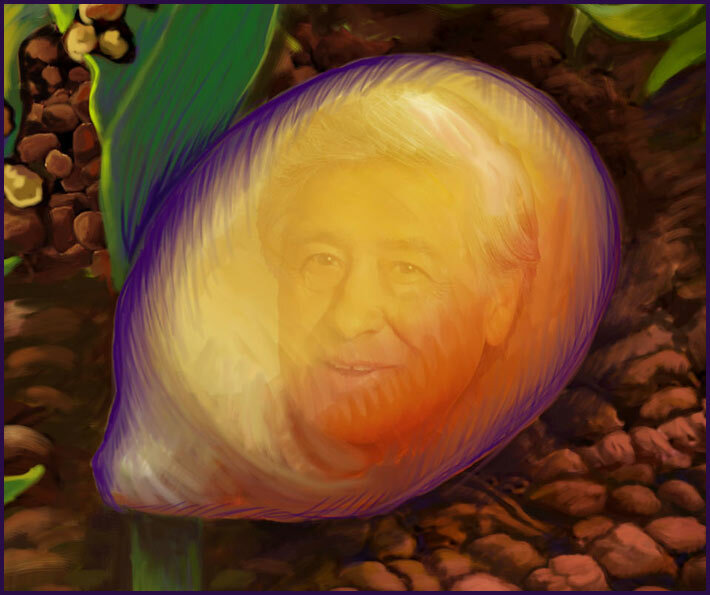 The 1) corn trinity, 2)urban environment, and 3)agricultural fields represent key elements in conveying the experience of the Miguel Contreras Learning Complex Community. The completion of this work is merely the initiation of a new journey to empowered generations to come. UCLA @ SPARC Staff: Carlos Rogel and Farhad Akhmetov. UCLA students: Jose Ramirez, Jr.Karina Perez, Adriana Macias, Barbara Dube, Mariana Bruno, Rosalinda Ruiz, Damina Green, Armando Cortez and Students of the Miguel Contreras High School: Aldo Alonso, Adan Jimenez, Abigail Garcia, Alex Jimenez, Carlos Perez, Jason Chacon, Ligni Garcia, Patricia Solano, Wendy Garcia, Ms. Corpus . From left to right, Carlos Rogel, SPARC Project Manager, Paul Mercado, Janna Shadduck-Hernandez, Project Director of the UCLA Center for Labor Research and Education, Kent Wong, Director of UCLA Labor Center, Karina Perez, MCLC Senior and president of the Pulse Club,(now UCLA student) Judith Baca, UCLA Professor, Sylviane Sans, Photographer, Nova Meza ,Vice Principal of MCLC, and Liz Torres, Actress. Our dearest Damina Green, UCLA Alumni and former student of Judy Baca at SPARC, inspired youth, peers, and instructors through her diligent work and lively presence. Damina played an important role in the development of the Gente del Maiz which is now installed at the Miguel Contreras Learning Complex. Always passionate about her work, Damina overflowed with enthusiasm to work with the youth of the Miguel Contreras community as well as peers. She possessed the ability to produce images to voice her ideas and experiences, which later allowed her to voice the experience of others such as the Miguel Contreras community. 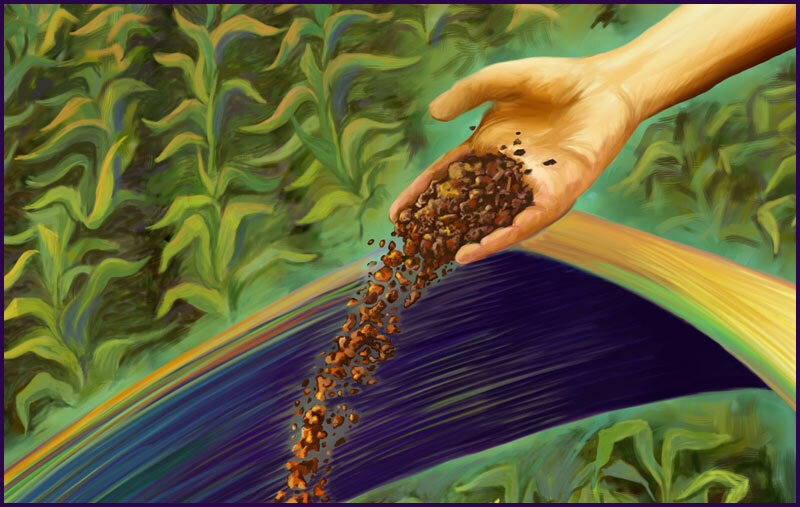 Damina contributed elaborate and beautiful work into the agricultural fields of the Miguel Contreras Mural. Full of joy and love she sought out to care for everyone around her without exceptions. Damina is an inspiration to all who met her and all who will meet her through her creative work on the Gente del maiz mural. The Miguel Contreras Learning complex cafeteria, located at 322 Lucas Avenue, Downtown Los Angeles California, is home to “Gente del Maiz.” This facility not only serves the students of the learning center primarily, but also provides a space for parents and teachers to gather for workshops and meetings all in efforts to enhance the learning experience for the community. 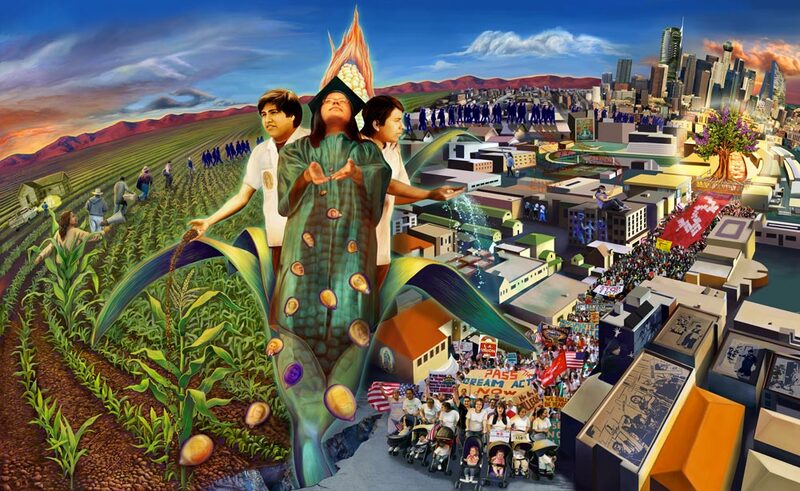 The center corn trinity image represents not only the first element of the “Gente del Maiz” mural but also a modern interpretation of “Gente del Maiz,” (the people of the corn) derived from Popol-Vuh, the Mayan creation story. Popol Vuhexplains the native understanding of how Hurakan, Chipi-Cakulha, and Raxa-Caculha, the trinity that composed Heart of the Sky, created humankind. First, He attempted to make them from mud but they crumbled at the attempt to move. Then He tried wood, but they did not posses hearts or minds and forgot who their maker was (Christenson 78). Finally, with help of the animals that fed off of maize, the Xmucane discovered the maize and ground it with other grinding to feed themselves. This food gave the divine grandparents strength and thus the “yellowness of humanity came to be”( 195). With this notion, the corn trinity image, which embodies three individuals, depicts the rotating stages of the past, present, and future. On the left side, stands Miguel Contreras, as a very young man when he first began as a labor organizer and fighter for working people with the United Farm Workers. In the middle is the proud, ever-present Graduate, looking towards the future as she is empowered by her education to give back to her community. She inspires, plants, and nurtures tomorrow’s leaders who (young man to the right) water these new local seeds which are to sprouts new life into the urban environment of Los Angeles. Christenson, Allen J. Popol Vuh: The Sacred Book of the Maya. Winchester : New York:O Books, 2003. Print. The soil depicted in Miguel Contreras’ hands symbolizes the strong foundation and nourishment needed for growth for future leaders. 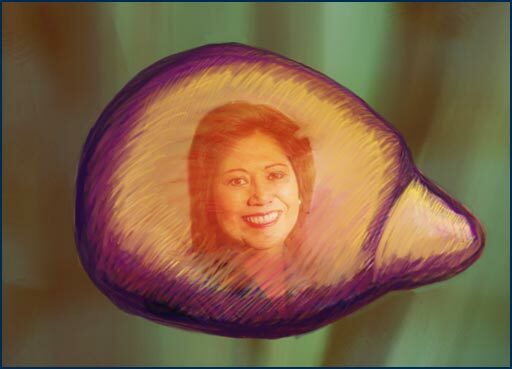 The various corn kernels being planted from the hands of the Graduate are the seeds of knowledge that also recognize major historical labor leaders, such as Luisa Moreno. Acknowledging the important contributions to society by past individuals honors the historical struggle of the labor movement . In addition, it paves the way for new ideas and leadership. The clear clean water abundantly flowing from the hands of the young future leader serves as healing hydration for the Los Angeles metropolis. 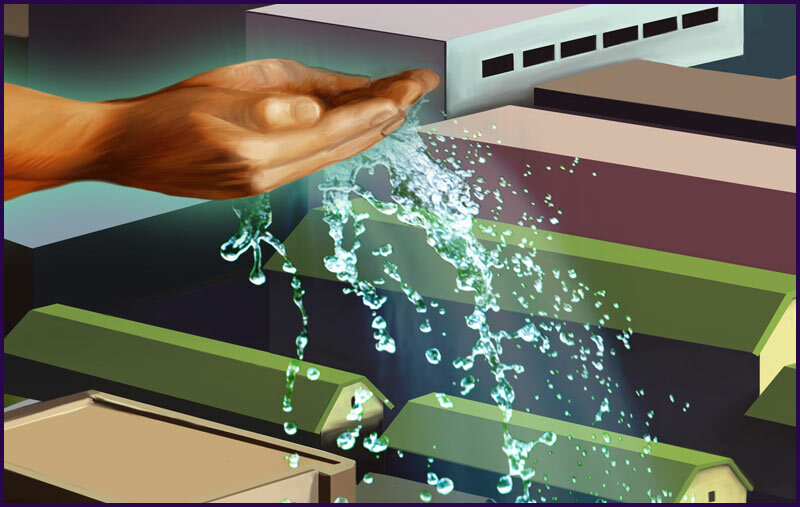 Not only is water a multicultural symbolism of life, but it is also a very powerful natural force. As it restores, it can also cut through hard materials, such as rock and metal. It is a fundamental aspect of life. From the young leader’s hands, this liquid elixir cascades life onto urban cities by falling on the march of the people, which fuels transformational movement. 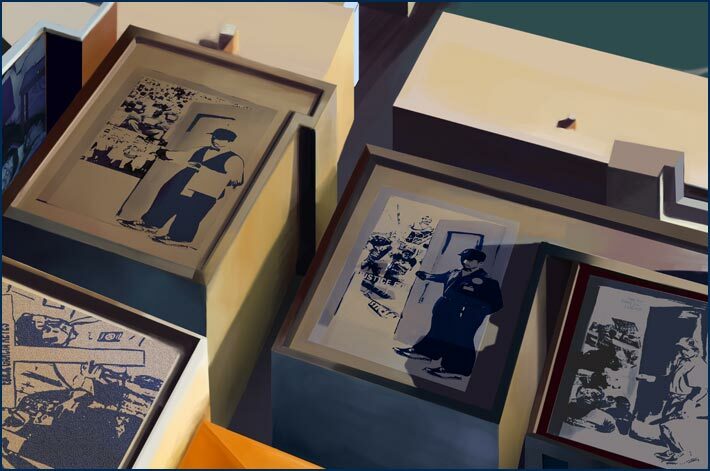 The urban scene is the second essential element of “Gente del Maiz” depicting the various realities that the Miguel Contreras Learning Community experiences. The images presented in the urban scene reflect common struggles such as police brutality, gang violence, overcrowding, and parents working two to three jobs to make ends meet. 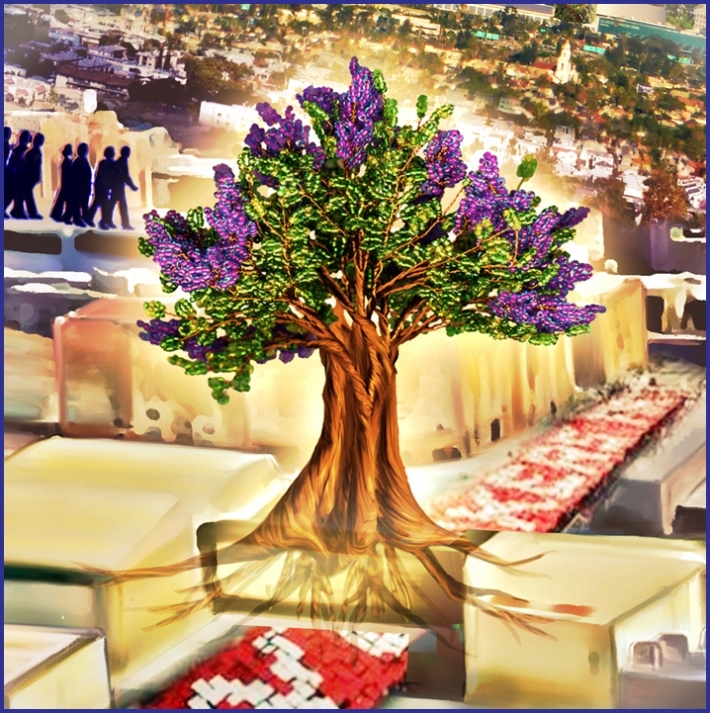 However, this unique community rooted in struggle flourishes to the dream for a better tomorrow. Through the arts the youth escape reality to feed a dream–a dream in which a better city exist. The urban city buildings bear tattoos on its walls telling the stories of past violence in the community. Although these tattoos depict difficult moments they aim to remind the community to keep working progressively for the betterment of their community. Thus enforcing the notion that a community must be aware of where they came from to know where it is going. The overcrowding narrative was designed to express the lack of personal space and privacy in many students’ homes. Financial circumstances force families to live together in small, overpriced units. Often youth take to the streets in order to gain personal space. The wearing of three uniforms is another story developed from the community. These uniforms represent the multiple occupations held concurrently by community members just to stay financially afloat. Some parents had solemn concerns, expressing their desire for quality family time; nonetheless, financial need inevitably takes priority. Many MCLC students shared a common outlet for their personal anguish–music. Artistic channels, such as music and drawing, allowed students to create individual sanctuaries. Through music they were able to imagine a better tomorrow. Through art they were able to make better choices with their time. What will be the future cities? What will they look like and what will they hold? The future city is integrated into the mural, complimenting its cycle of past, present, and future. More importantly, pressing environmental matters can no longer be ignored. Future developments to address concerns about both ground greenery and sky rise greenery manifest in the form of sky terraces and rooftop gardens. Environmental development is of much importance, especially in high-density areas which often lack green space. The farm field represents California’s agricultural landscape, where important fruits of major labor movements have sprouted. Also, this particular field represents Miguel Contreras’ labor movement’s origins and struggles due to union affiliation. Agricultural fields, especially in California, have fed-and continue to feed–the nation. 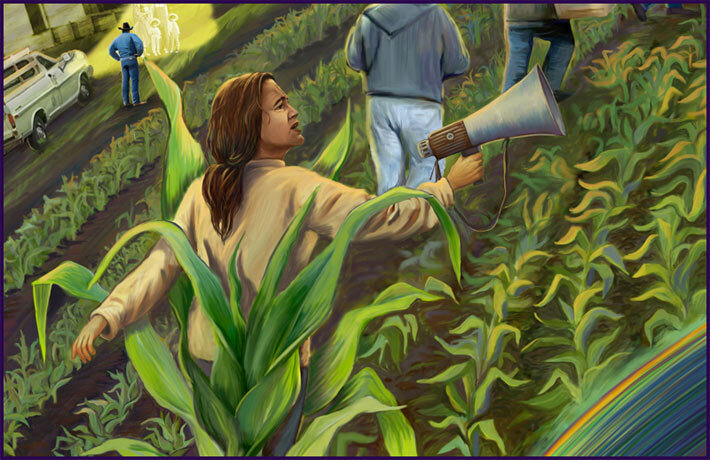 The fields not only provide food, but they also feed the nation with important labor leaders who change and create policy at the local, state and national levels. The hardworking Miguel Contreras family lived on a farm in Salinas, where they won their bread by plowing the field. Miguel Contreras and his family outside the farmhouse depict the struggles endured by his family as they were fired and ejected due to their union affiliation. According to Kent Wong in Miguel Contreras: Legacy of a Labor Leader, “at 4:30 [in] the morning our three-year UFW contract expired in 1973…the ranch supervisor and crew bosses assembled the entire Contreras family in front [their] little home. With the headlights from their pickup trucks shining in our eyes, they fired [them] all” (7). Contreras, Miguel. Cesar Chavez Day event, Long Beach, California. 28 March 2005. Wong, Kent and Michael Viola. Miguel Contreras: Legacy of a Labor Leader. Los Angeles: UCLA Center for Labor Research and Education, 2009. The march takes the overall form of an ear of corn, part of an overarching circle. 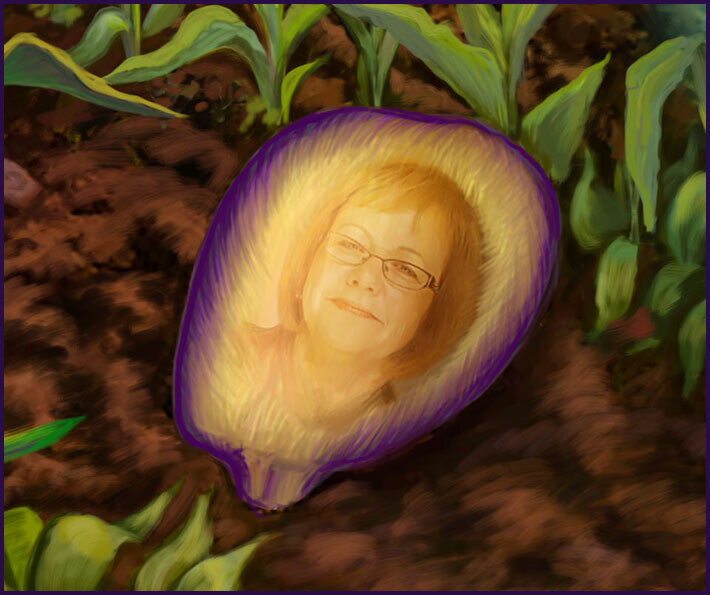 The shape of the corn kernel shows the cyclical pattern of birth, life, creation and resurrection. 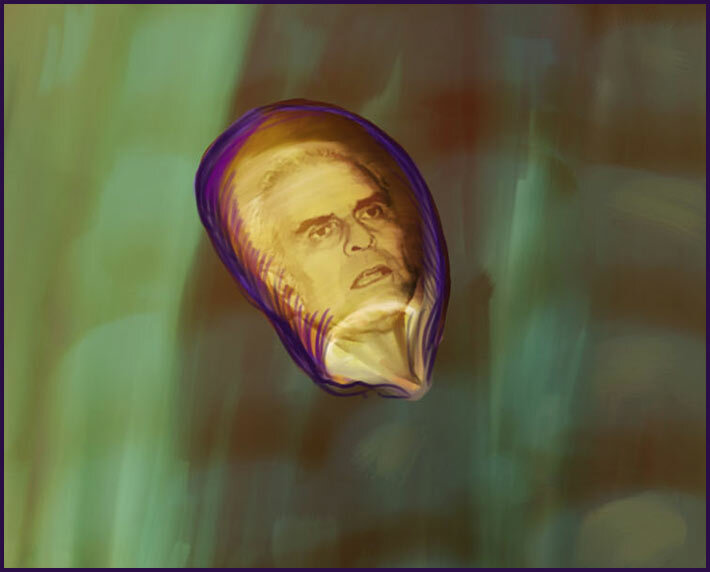 Gonzales, Manuel. Mexicanos: A History of Mexicans in the United States. Bloomington and Indianapolis: Indiana University Press, 1999. Maria Elena Durazo, the daughter of Mexican immigrant farm workers, understood the importance of union labor and dedication to justice for workers at a young age just like Miguel Contreras. She was elected to serve as Executive Secretary-Treasurer of 300 local unions on May 15, 2006, and she worked at the Los Angeles County Federation of Labor which represents over 800,000 workers in every key industry, including transportation/goods movement, entertainment/media, services, janitorial and hospitality, education, construction, retail, and the public sector. A resident of Los Angeles, Maria Elena is the mother of two sons, Mario and Michael, grandmother to Seneca and Sydeny and the widow of Miguel Contreras, former Executive Secretary-Treasurer of the Los Angeles County Federation of Labor, AFL-CIO. 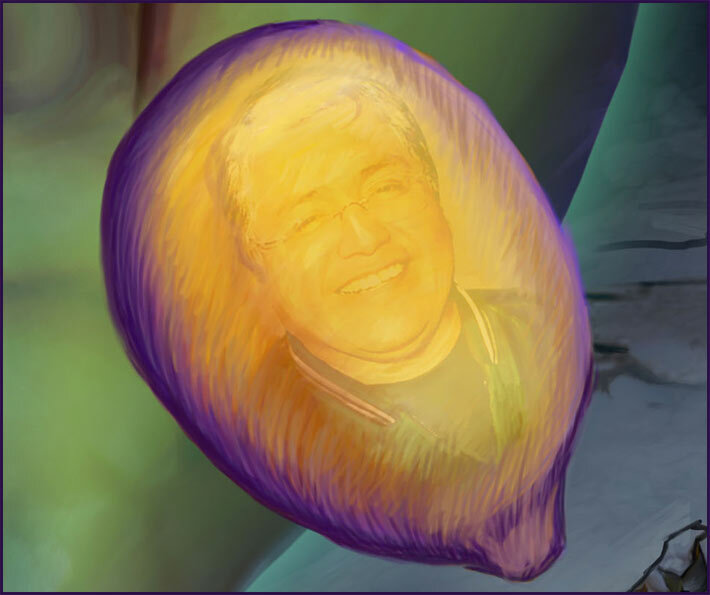 According to Kent Wong in Miguel Contreras: Legacy of a Labor Leader, “Now that Miguel is gone, it is our duty to finish the work he has begun among us. With the example of Miguel’s life and work as our guide with the sacrifice and suffering of ordinary workers who organize, march, and walk a precinct everyday let us continue the fight to grow this great movement, seeking divine assistance and inspiration, yet recognizing that ultimate success or failure rests in our hands” (1). 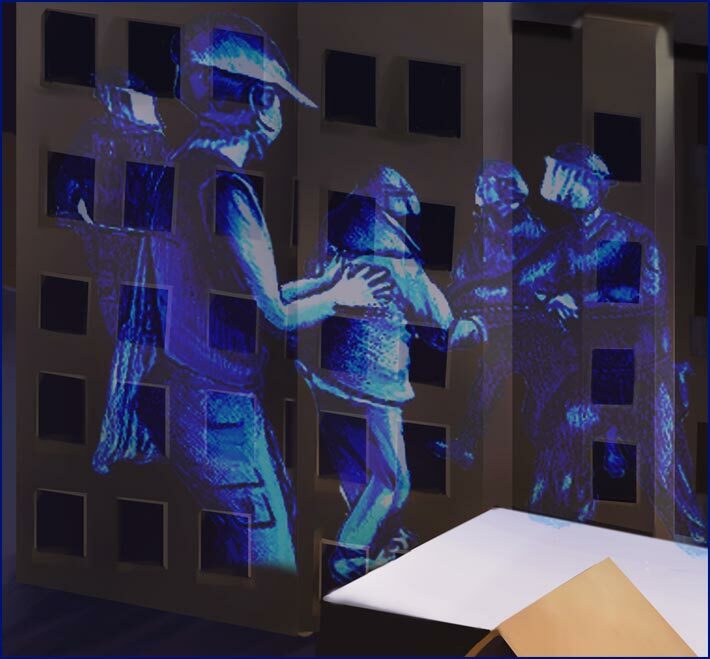 Maria Elena Durazo is depicted immersed in a contemporary urban labor movement wave. She has been a key contributor in improving the quality of life of many workers, such as janitors, in the state of California and the nation. An important event organized by Maria was the Hollywood to the Docks, where she was key in making a stunning collective composed of diverse working backgrounds, such as janitors and actors. She is at the forefront of a contemporary female labor leadership impacting the nation. Durazo, Maria Elena. Eulogy to her husband, Miguel Contreras. Los Angeles, California. 12 May 2005. Maria Elena Durazo. Maria Elena Durazo. Home page. 2007. 22 March. 2011 . Kent Wong’s Miguel Contreras: Legacy of a Labor Leader explains that the L.A. County Fed was chartered in 1959, after the American Federation of Labor (AFL) and the Congress of Industrial Organizations (CIO) had merged into AFL-CIO. 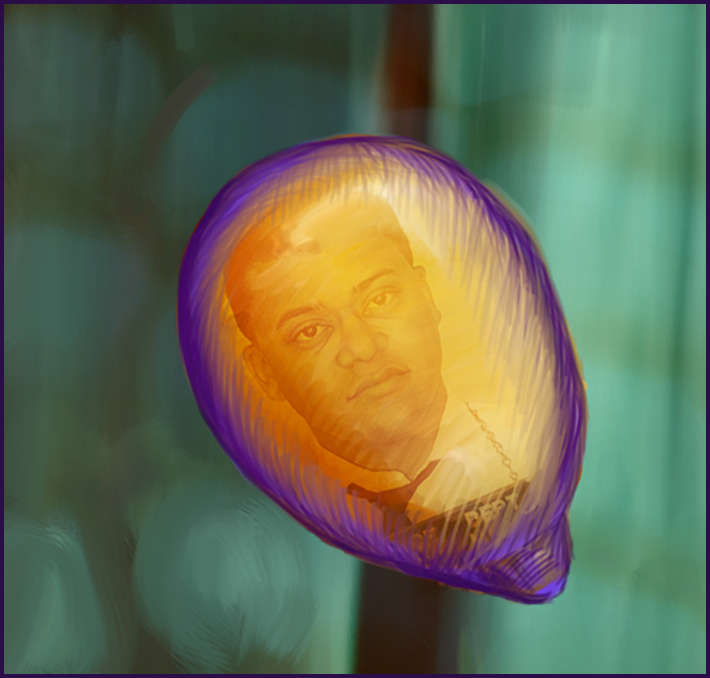 Throughout its 102-year history, the union council saw its first leader of color in Miguel. Focusing on creating positive changes for workers and their families, Miguel strove to transform the federation’s ‘business union’ model with a social-justice oriented framework. Miguel stated, “I think my election is the labor union reflecting its leadership, and I think it sends a strong message to the immigrant community that unions are not just open to them we are them…Cesar taught me right, that every day we have to wake up and organize, organize, organize” (qtd. in Wong 21). 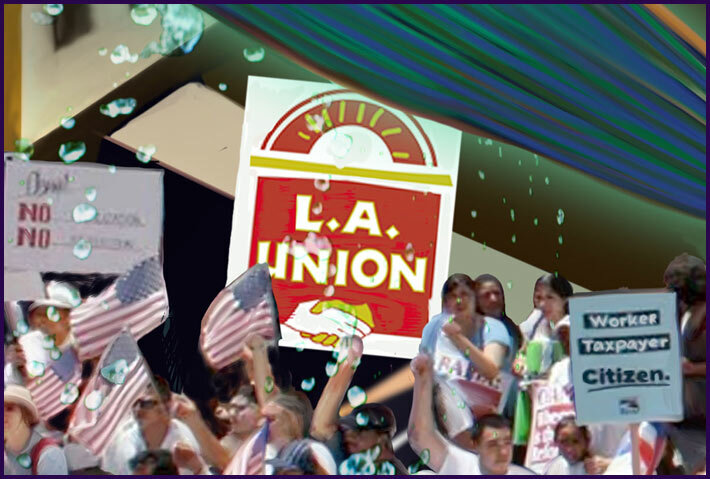 In a 2002 interview, Miguel reflected on California union membership, stating, “We have such a huge membership-about 800, 000 union members in L.A. County. We’re the biggest of any group, union or otherwise….We have the most Latino members of anybody, the most African Americans members, the most-you name it and we’re the biggest of any group. And our agenda is not geographical or cultural or political. We’re based on economics. That’s what ties us together. That’s what ties the Latino family with the black family who are both on strike together, because they’re not fighting for who has a better job, they’re fighting…for better economics” (qtd. in Wong 21). Kanter, Larry. Union general: Miguel Contreras Interview. Los Angeles Business Journal 20 January 1997. Milkman, Ruth and Kent Wong. 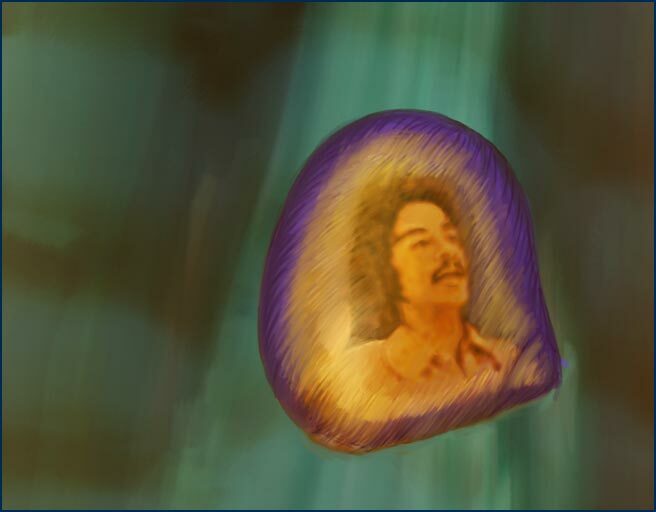 Miguel Contreras was born on September 17, 1952, and was raised working in the fields of Dinube in the Central Valley, where at the age of five he carried water to his father and old brothers as they picked raisin grapes. Both of his parents were farmworkers – his father came from Mexico in his 20s as part of the bracero guest-worker program. After stints working on the grape boycott in Toronto, Canada, organizing lettuce workers in Salinas, and helping lead local hotel workers in a month-long strike in San Francisco, Contreras was recruited as a national organizer for the International Hotel Employees and Restaurant Employees Union. The job brought him to Los Angeles in the late 1980s. The hotel workers’ Local 11 was embroiled in a power struggle, and Contreras was charged with sorting out allegations of ballot fraud. Organizer Maria Elena Durazo, who was challenging the local’s leadership, led her supporters in rowdy picketing, protesting Contreras’ involvement. She eventually was elected president of the local, and her views on Contreras changed–the two married in 1988. In Los Angeles, Contreras found a city that had been historically hostile to unions. Although by the 1980s, labor had emerged as a key Democratic ally, its participation in local politics was limited. In 1994, he was tapped as the Federation’s political director and immediately sought to reshape the unions’ role. Contreras applied himself to winning over the often-quarreling local union leaders and insinuating himself into the city’s power structure. At a time when the national labor movement had struggled, Los Angeles’ unions have racked up a remarkable number of victories, securing a living wage ordinance in the city, winning substantial wage increases for workers and beating back a state initiative aimed at limiting the collection of union dues for political purposes, among other measures. Since Contreras was elected Secretary-Treasurer of the Federation in 1996, becoming the first nonwhite to win the seat, the unions’ ranks have grown by 125,000 to more than 800,000, an increase fueled mostly by the city’s burgeoning Latino immigrant population. Despite its growth, the Federation’s political activism has alarmed some leaders of the area’s building trades. Older unions with largely white and African American memberships believed Contreras used the Federation to advance the influence of Latinos. Contreras said that his strategy simply acknowledged demographic realities. “If we’re going to grow our union membership in Los Angeles, it’s because we’re making an outreach to workers that are here,” he said. Contreras sought to smooth over anxiety by building coalitions with African American pastors and community leaders around issues such as a proposed Walmart in Inglewood. In the last two years, the federation has run successful high-profile campaigns for two African American candidates. Martin Ludlow, a former federation political director, won his race for City Council. Likewise, Karen Bass won a state Assembly seat. In 2000, he helped lead a strike by janitors, many of them poor immigrants, against building owners in Los Angeles. The work stoppage ended with a new contract for the janitors that was touted as a model for blue-collar labor organizations across the country. Union members celebrated with a march through the city. At the same time, he played a key behind-the-scenes role in resolving the strike, when he appealed to the Rev. Jesse Jackson to act as a mediator after it appeared negotiations had broken down. Days later, both sides reached agreement after Jackson kept them at the negotiating for nearly 24 hours. Despite all his success, Contreras died with one goal unfulfilled. “I have one desire left, one thing I want to accomplish: to help take someone to the White House,” he told the Los Angeles Times earlier this year. At the time of his death, Contreras served on the boards of LA Inc. (Los Angeles Convention and Visitors Bureau), United Way, HAVA (Help America Vote Act), and the Narcotic Addicts Evaluation Authority. He was vice president of the California Labor Federation, AFL-CIO. Contreras is survived by his wife, fellow labor organizer Maria Elena Durazo, and two sons, Michael and Mario. UCLA Center for Labor Research and Education, 2009. Maria Elena Durazo, the daughter of Mexican immigrant farm workers, understood the importance of union labor and dedication to justice for workers at a young age just like Miguel Contreras. She was elected to serve as Executive Secretary-Treasurer of 300 local unions on May 15, 2006, and she worked at the Los Angeles County Federation of Labor which represents over 800,000 workers in every key industry, including transportation/goods movement, entertainment/media, services, janitorial and hospitality, education, construction, retail, and the public sector. A resident of Los Angeles, Maria Elena is the mother of two sons, Mario and Michael, grandmother to Seneca and Sydeny and the widow of Miguel Contreras, former Executive Secretary-Treasurer of the Los Angeles County Federation of Labor, AFL-CIO. Maria Elena explains, “Now that Miguel is gone, it is our duty to finish the work he has begun among us. 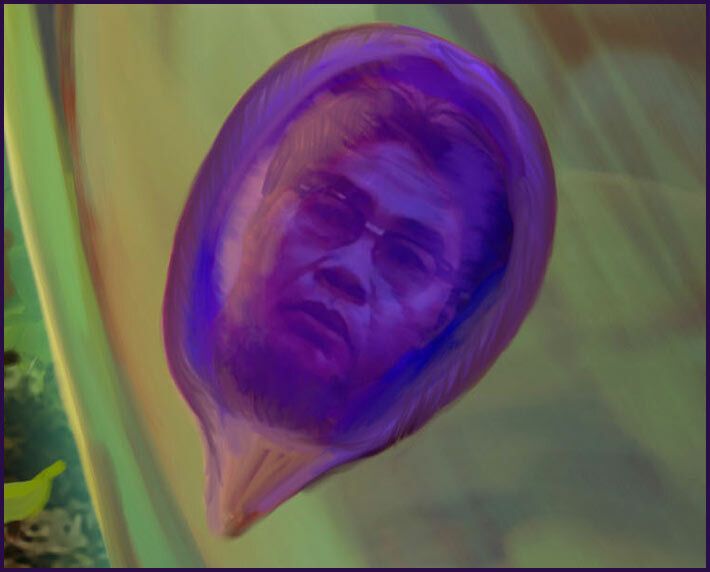 With the example of Miguel’s life and work as our guide with the sacrifice and suffering of ordinary workers who organize, march, and walk a precinct everyday let us continue the fight to grow this great movement, seeking divine assistance and inspiration, yet recognizing that ultimate success or failure rests in our hands” (Wong 1). Maria Elena Durazo is depicted immersed in a contemporary urban labor movement wave. She has been a key contributor in improving the quality of life of many workers, such as janitors, in the state of California and the nation. An important event organized by Maria was the Hollywood to the Docks, where she was key in making a stunning collective composed of diverse working backgrounds, such as janitors and actors. She is at the forefront of a contemporary female labor leadership impacting the nation. Luisa Moreno became involved in organizing when she was a teenager in Guatemala. She worked with La Sociedad Gabriela Mistral on a campaign that allowed for the acceptance of women into universities in Guatemala. In 1927, she married Angel De Leon. She immigrated to New York City in 1928. During the Great Depression she worked as a seamstress and managed to organize her co-workers into a garment workers union. In 1935, the American Federation hired her as an organizer. She then moved to Florida and organized cigar rollers. After that, she joined the Congress of Industrial Organizations (CIO) and was a representative for the United Cannery, Agricultural, Packing, and Allied Workers of America (UCAPAWA). 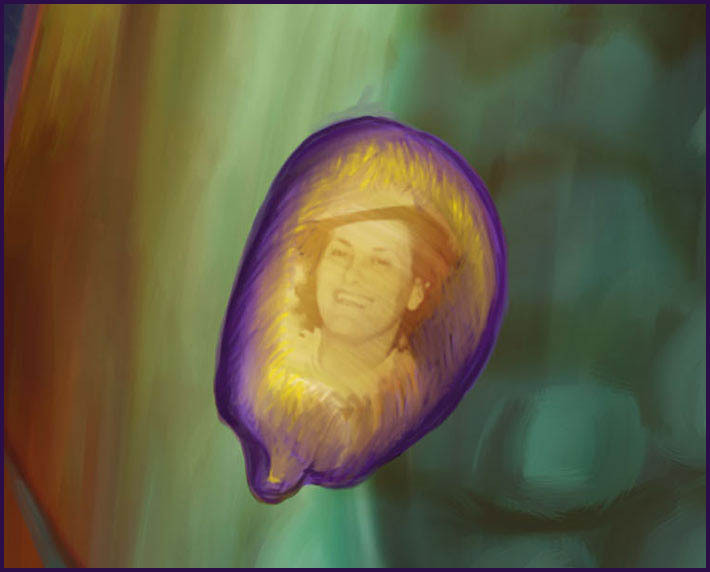 She then organized pecan-shelling plants in San Antonio and cannery workers in Los Angeles. By 1937, she had moved to San Diego. 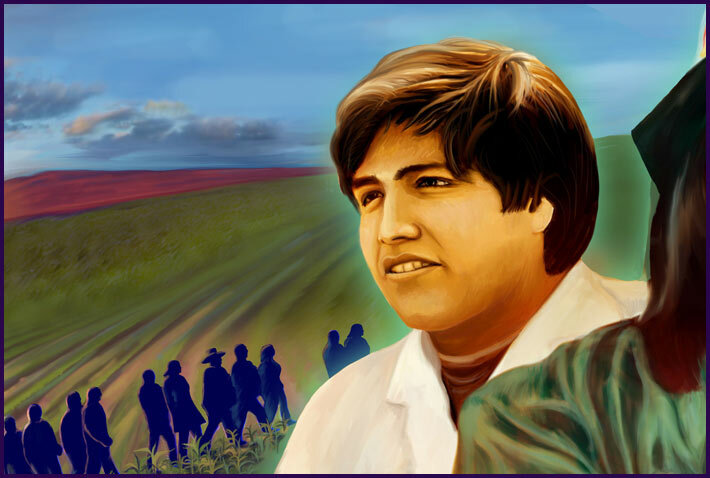 Cesar Chavez and Dolores Huerta began organizing San Joaquin Valley farm workers in 1962. During the grape boycotts of the 1960s and 1970s, the United Farm Workers was the most visible Chicano-identified organization and stressed a mestizaje that stressed nationalism and coalition building. Young people—referred to as a “multiethnic horde of idealistic…student volunteers—were powerful within the movements, not only organizing campus support groups but also serving in the fields (Ruiz 119). Working closely with the UFW, young adults devoted their time as health workers, legal interns, boycott coordinators, media specialists, and organizers. By 1973, the UFW had secured contracts with 80% of grape growers in the San Joaquin Valley and had exploded its membership to over 100,000 individuals. Chavez had become “a charismatic leader preaching social justice and nonviolence [who] became the most prominent advocate for the rights of Mexicans in the United States” (119). Ruiz, Vicki. From Out of the Shadows: Mexican Women in Twentieth-Century America. New York and Oxford: Oxford University Press, 1999. Philip Vera Cruz immigrated to the United States in 1926. He settled in Delano, California and became a farmworker. During the 1950s he joined the National Farm Labor Union. He was part of the Agricultural Workers Organizing Committee (AWOC) in his local union. His union was in solidarity with the UFW and farmworkers movement to start the Delano grape strike in 1965. To combat the growing power of the strike, the Delano local decided to strike against the grape growers. In response, leaders of the National Farm Workers of America such as Cesar Chavez and Delores Huerta met with the leaders of the National Farm Labor Union like Philip Vera Cruz and Larry Itliong to combine their unions to form the United Farm Workers in 1966. After this union the the Delano grape strike lasted until 1970. Bert Corona was a Chicano trade union and civil rights leader. He served in El Congreso de Pueblos de Habla Espanola, the first civil rights assembly for Latinos in the United States, becoming a leader in their youth division at the age of 21. In 1968, Bert also co-founded El Centro de Accion Autonoma-Hermandad General de Trabajadores (CASA) with civil rights activist Chole Alatorre. Dedicated to securing workers’ and families’ rights, CASA provided legal and social services for undocumented Mexicano and Latino immigrants. Vicki Ruiz notes that CASA was “the first Chicano-era organization to explore systematically the significance of the relationship between immigration, Chicano ethnicity, and the status of Mexican Americans in the United States’” (117). Rose Pesotta was born in Derazhina, Ukraine. When she was 17 she immigrated to New York City and found work in a shirtwaist factory. She joined the International Ladies Garment Workers’ Union (ILGWU) which represented garment workers, and she eventually became the first woman to be part of the executive board for ILGWU Local 25. The IGLWU then sent her to Los Angeles to organize garment workers. Her success organizing a strike for the garment workers in Los Angeles propelled her to the position of ILGWU vice president. She also had a key role in organizing garment workers for the ILGWU in Montreal. In 1944, she resigned from her role as member of the executive board of the ILGWU because she didn’t believe that women had fair representation in the union; the membership of the union was predominantly female, yet she was the only female representative on the board. James Morris Lawson was born September 22, 1928 in Uniontown, Pennsylvania. He worked with Martin Luther King Jr. In addition, while he was enrolled at the Divinity school of Vanderbilt University, he was involved in the Nashville Student Movement, such as in the Freedom Rides. Lawson’s expulsion from Vanderbilt as a result of these activities became one of the celebrated incidents of the era and eventually a source of deep embarrassment to the university. During the 2006 graduation ceremony Vanderbilt apologized for its treatment of Lawson. Reverend Lawson moved to Los Angeles in 1974 to lead Holman United Methodist Church. Reverend Lawson has been spearheading California State University Northridge’s (CSUN) Civil Discourse and Social Change initiative as a Visiting Faculty for the academic year of 2010-2011. The initiative builds on CSUN’s history of activism and diversity, while focusing on the current budget and policy battles surrounding education. Chavez was born to a migrant family on November 12, 1929, near Yuma, Arizona, on a family farm. He worked as a child migrant worker during the Great Depression. He transitioned from farm work to carpentry and moved to San Jose, California. In the early 1960s, Chavez would leave his job as a carpenter in order to assist Cesar Chavez in his effort to organize California farm workers. Richard Chavez was a co-founder of the National Farm Workers Association, which would later become known as the United Farm Workers (UFW). Richard Chavez spearheaded the construction of the United Farm Workers’ union hall, which became its headquarters, in Delano, California. In 1962, Richard Chavez designed the now iconic logo of the United Farm Workers, which features a black Aztec eagle. Decades later, U.S. President Barack Obama called the eagle, “a symbol of hope that has helped carry the struggle for the rights of farm workers forward for almost five decades.” Chavez organized the Delano grape strike and boycott, which spanned five years during the late 1960′s. Antonio Villaraigosa was born in City Terrace of Los Angeles County’s Eastside.He attended East Los Angeles College and transferred to University of California, Los Angeles (UCLA). While at UCLA, he was a leader at MEChA. In 1977, he graduated from UCLA with a B.A. in History. He went by the name of “Tony Villar; but, he started using Antonio in the 1980’s. 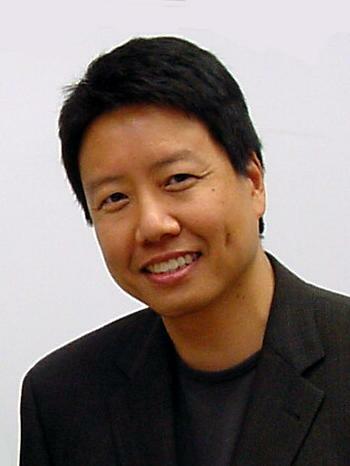 After UCLA, he attended People’s College of Law (PCL). PCL promotes labor union causes in Los Angeles.After PCL, he was a field representative and organizer for the United Teachers Los Angeles (UTLA). He also served as president of the Los Angeles chapter of the American Civil Liberties Union and the American Federation of Government Employees.From 1990 to 1994, he was appointed to the Los Angeles Metropolitan Transportation BoardStarting. In 2005, Villaraigosa became the 41st Mayor of Los Angeles. He is the first Latino Mayor, since 1872. After high school in 1979, Obama moved to attend Occidental College in Los Angeles. And after Occidental College, he attended Columbia University. Shortly after he graduated from Columbia University, he was hired as Director of the Developing Communities Project (DCP) in Chicago’s South Side working as a community organizer from 1985 to 1988. He was assisted in creating a job training program, a college preparatory tutoring program and a tenant’s rights organization. In 1988, he started at Harvard Law School where he became president of the Harvard Law Review. And in 1992, he was the Director of Project Vote, a voter registration campaign in Illinois. It registered an outstanding 150, 000 out of 400, 000 unregistered African Americans in the state. From 2005 to 2008, he served as a United States Senator. 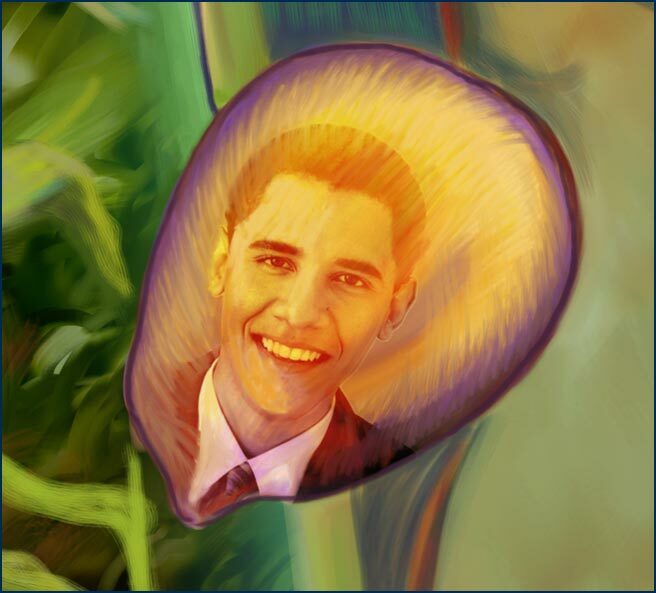 In 2009, he became the 44th President of the United States, and he is the first African American. Also in 2009, he was awarded the Nobel Peace Prize. Hilda Solis was born in Los Angeles, California. She has four sisters and two brothers. In La Puente, California, she grew up in a tract home. Of her family, she became the first to go to college. She went to California State Polytechnic University Pomona and graduated in 1979 with a Bachelor of Arts in Political Science. Later in 1981 at the University of Southern California, she achieved a Master of Public Administration degree. In 1982, she became Director of the California Student Opportunity and Access Program in order to assist disadvantaged youth to acquire necessary preparation for college. Later in 1985, she became Board of Trustees member for the Rio Hondo Community College District. At the college, she improved vocational job training. Furthermore in the State Senate, she championed to prevent domestic violence, championed labor, education and health care issues. In December 2008, President Barack Obama announced his intention to nominate Solis as United States Secretary of Labor. In February 2009, she became the first Hispanic Secretary of Labor. 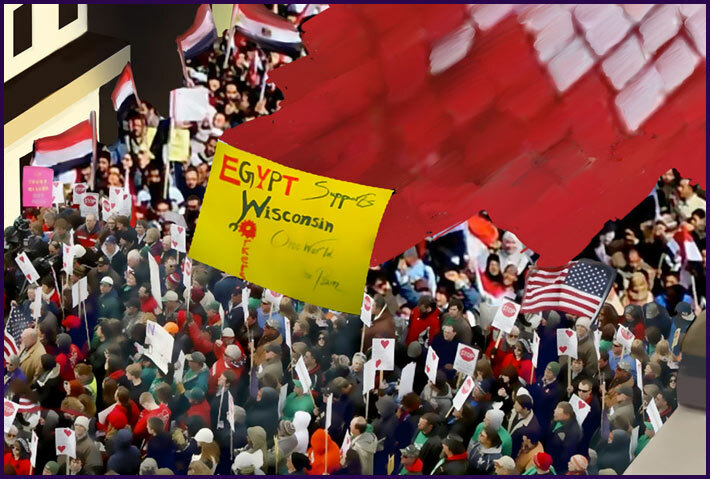 In February 2011, about protests over the proposal of the Wisconsin Governor Scott Walker to limit state’s public employee union’s collective bargaining rights and other similar proposals made in other states, she stated “[those governors] aren’t just asking workers to tighten their belts; they’re demanding they give up their uniquely American rights as workers.” In 1994, he was elected to the California State Assembly. In 2003, she won a seat for the Los Angeles City Council representing the 14th district. Throughout human history, trees have been powerful symbols. Trees represent life and growth as they reach down to the ground and up to the sky at the same time. Among pre-Columbian and Mesoamerican cultures, the concept of “world trees” is a prevalent motif in mythical cosmologies and iconography. It is thought that Mesoamerican sites and ceremonial centers frequently had actual trees planted at each of the four cardinal directions. 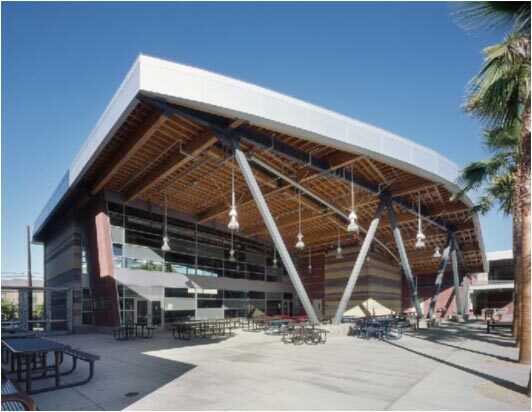 The tree located on the bridge of the Miguel Contreras Learning Complex symbolizes the high school as the heart of the community, especially among the students. Miguel Contreras Students explain that this bridge represents a separation of their city . West of this bridge lives the painteresque, determined, and unique Miguel Contreras community. Toward the East lies the corporate, busy, and developed Downtown Los Angeles. Students reflect on the notion that like the bridge they are center to a path to success. 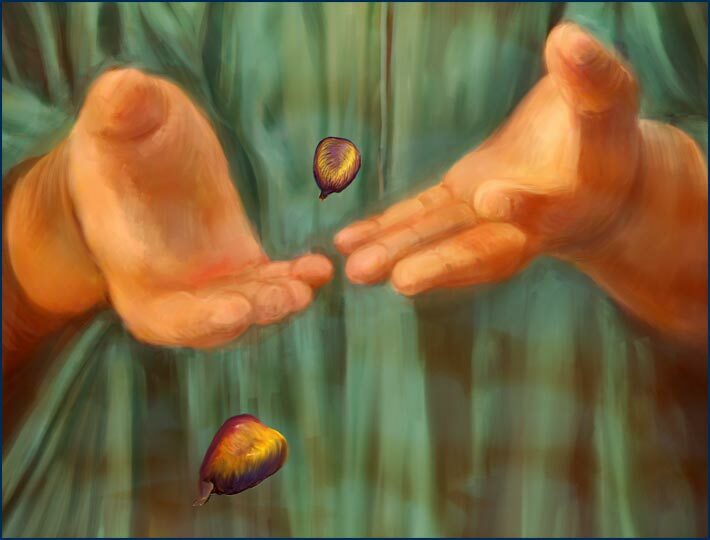 In their hands they hold the power to take their roots and experiences to reach up for their dreams. Miguel Contreras was born on September 17, 1952, and was raised working in the fields Dinube of the Central Valley, where at the age of five he carried water to his father and old brothers as they picked raisin grapes. Both of his parents were farmworkers – his father came from Mexico in his 20s as part of the bracero guest-worker program. After meeting Cesar Chavez at a rally for Robert F. Kennedy, the Contreras family because active in United Farm Workers in the late 1960s. By the time he was 17, Contreras and his brothers were driving to San Jose on weekends to hand out grape boycott leaflets at grocery stores. The hotel workers’ Local 11 was embroiled in a power struggle, and Contreras was charged with sorting out allegations of ballot fraud. Organizer Maria Elena Durazo, who was challenging the local’s leadership, led her supporters in rowdy picketing, protesting Contreras’ involvement. She eventually was elected president of the local, and her views on Contreras changed the two married in 1988. In 1994, he was tapped as the Federation’s political director and immediately sought to reshape the unions’ role. Contreras applied himself to winning over the often-quarreling local union leaders and insinuating himself into the city’s power structure. At a time when the national labor movement has struggled, Los Angeles’ unions have racked up a remarkable number of victories, securing a living wage ordinance in the city, winning substantial wage increases for workers and beating back a state initiative aimed at limiting the collection of union dues for political purposes, among other measures. Despite its growth, the Federation’s political activism has alarmed some leaders of the area’s building trades, older unions with largely white and African American memberships, who believed Contreras used the Federation to advance the influence of Latinos. Contreras said that his strategy simply acknowledged demographic realities. “If we’re going to grow our union membership in Los Angeles, it’s because we’re making an outreach to workers that are here,” he said. But he sought to smooth over anxiety by building coalitions with African American pastors and community leaders around issues such as a proposed Walmart in Inglewood. In the last two years, the federation has run successful high-profile campaigns for two African American candidates. Martin Ludlow, a former federation political director, won his race for City Council and Karen Bass won a state Assembly seat. The funeral took place on May 12, 2005, at the Cathedral of Our Lady of the Angels with Cardinal Roger M. Mahony as Principal Celebrant. Pall Bearers were Mario Salazar, Alex Contreras, Antonio Contreras, David Contreras, Juan Contreras, Pablo Contreras, Charles Lester, and Arturo Rodriguez. The mission of the Miguel Contreras Foundation (MCF) befits the life and legacy of this great Californian and transformational labor leader. By focusing on education and civic engagement, the Miguel Contreras Foundation can help train the next generation of California leaders and ensure that educational opportunities are better for tomorrow’s workers. 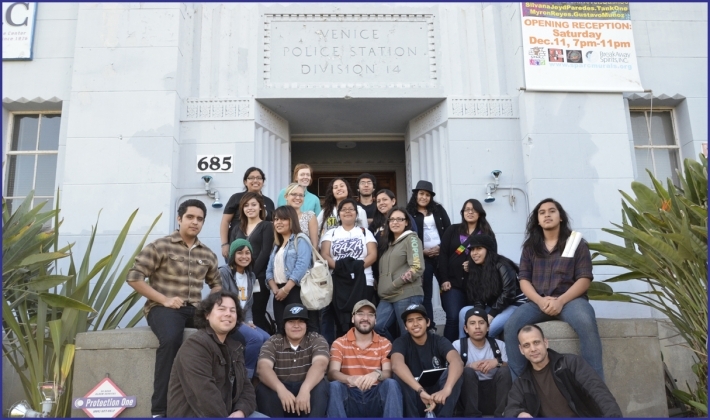 Housed in the UCLA Downtown Labor Center, the foundation is a partnership between the Los Angeles County Federation of Labor and the UCLA Labor Center and will focus on education, civic participation and integrating immigrants. The foundation’s focus on education will involve providing educational and leadership opportunities for students at public schools to access apprenticeship programs and higher education. For schools with labor studies programs, student leadership academies will be created by the foundation. Additionally, the foundation will hold workshops, dubbed “parent universities,” for parents to learn techniques with which they can advocate for a better education on behalf of their high school students. To encourage civic participation, the foundation will hold trainings for workers and organizers on methods of empowerment through engagement the political and legislative process, particularly in underserved communities. To improve immigrant integration, the foundation will support research, leadership programs and other initiatives focused on improving educational and working conditions for immigrant workers, organizers and shop stewards. The foundation will also work to foster stronger connections between unions, worker centers and immigrant rights groups. 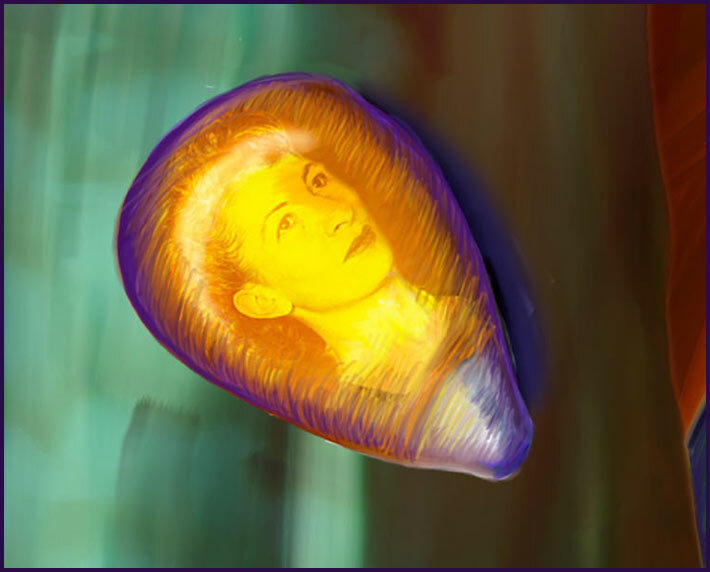 Josefina Fierro de Bright was born in 1914 in Calexico, California. 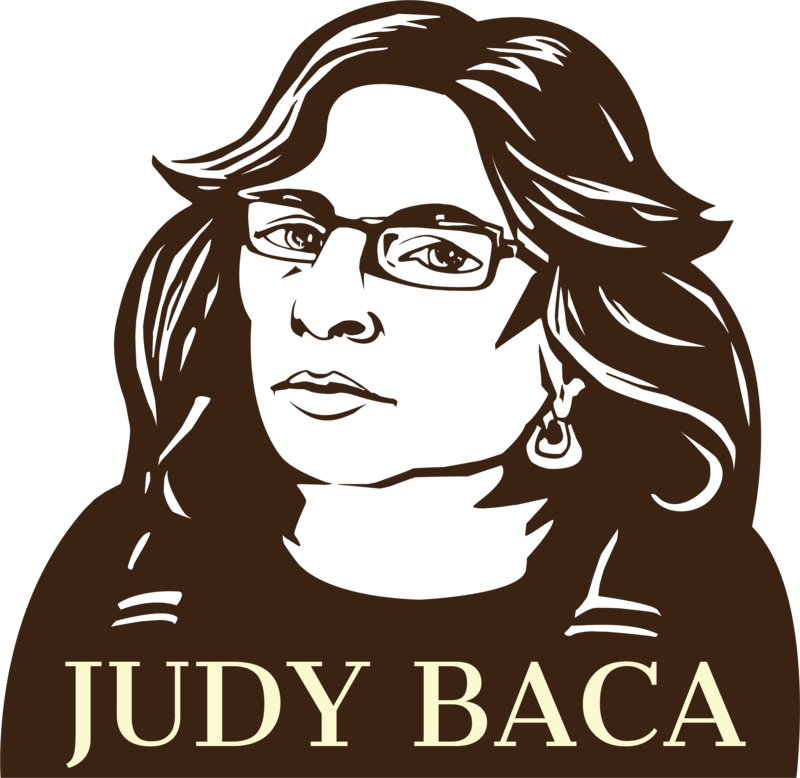 When she was 18 years old she attended UCLA and intended to study medicine; however she became very involved in advocating for the rights of Mexican Americans. 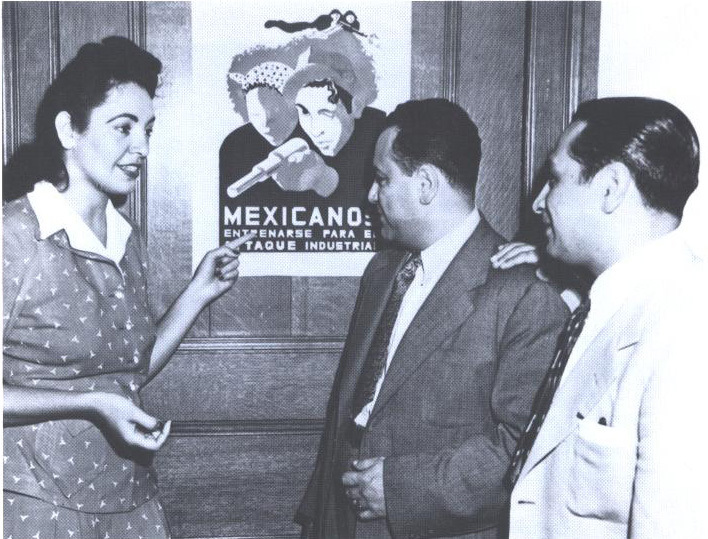 After hearing about her efforts in organizing boycotts against racist companies that refused to hire Mexican American workers in predominantly Mexican American communities, she was approached in 1939 by El Congreso del Pueblo de Habla Espanola (Spanish-speaking People’s Congress) to establish a branch in Los Angeles. El Congreso del Pueblo de Habla Espanola is an organization that advocated for the rights of Spanish-speaking working class people in the United States. According to Manuel Gonzales, “raised in the barrios of Denver, Gonzales first achieved national prominence as a prize fighter in the early fifties….When he left the ring, he turned to Democratic politics in his hometown” (Gonzales 204). 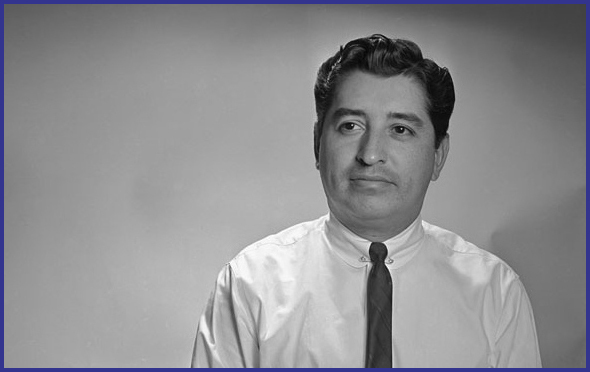 A Colorado coordinator of the Viva Kennedy Clubs in 1960, he proceeded to serve in multiple War on Poverty programs and quickly become a “one-man directory of poverty agencies.” Like other barrio leaders of his time, Gonzales lost faith in conventional party politics and founded a separate organization called La Crusada Para la Justicia (The Crusade for Justice). He hoped to better serve the Denver Mexican community and saw that the future of that community within urban areas, focusing specifically on engaging young people (204). 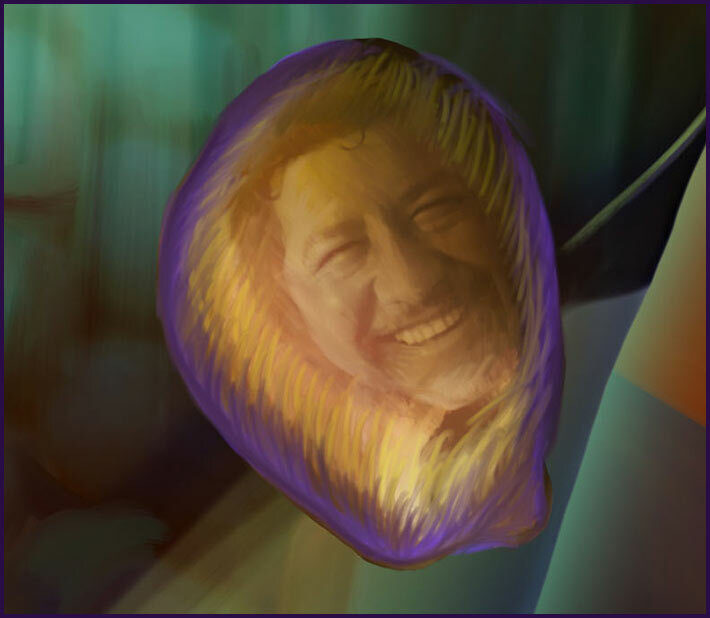 Gonzales, Manuel. Mexicanos: A History of Mexicans In the United States.Bloomington and Indianapolis: Indiana University Press, 1999. Ruben Salazar was a K-MEX reporter and Los Angeles Times columnist. On August 29, 1970, police fired at women and children who were attending a peaceful protest rally in Laguna Park in East Los Angeles. The rally was attended by over 20,000 people and became known as the Chicano Moratorium. After this ‘riot,’ a Los Angeles County deputy shot tear gas into the Silver Dollar Bar, where Ruben Salazar was having a drink and undoubtedly discussing the incident that had just occurred at the park. An unexploded tear gas canister killed Ruben, but a televised inquest later ruled his death an accident. 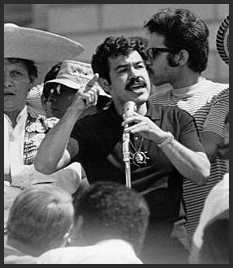 According to Vicki Ruiz, “The Chicano Moratorium shook the student movement to its core—sixty people had been wounded and three Chicanos, including Salazar, lost their lives” (115).